Semi-professional faucets are easy to operate and can speed up the process of cleaning dishes. Q: I’m moving into an apartment without a dishwasher. No big deal, since I like washing dishes by hand. However, I would like to remove the present faucet and install a kitchen faucet that’s more user-friendly for washing dishes by hand. Any suggestions? A: Most restaurant kitchens include at least one commercial-grade faucet with a heavy-duty flexible hose for a spout. The hose is supported by a high-arching spring-like coil. At the end of the hose is a powerful spray head used for washing off the plates. 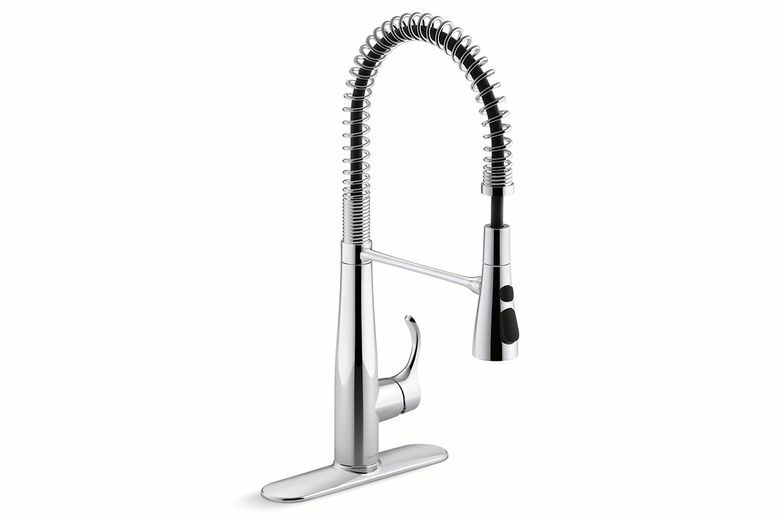 These faucets are easy to operate and really speed up the process of cleaning dishes. These semi-professional versions of spring-loaded faucets are available for home use. Features include a multi-function head for standard water use and spray-cleaning tasks, a magnetic docking arm to lock the head in place and a booster button to increase the water flow for pressure rinsing.